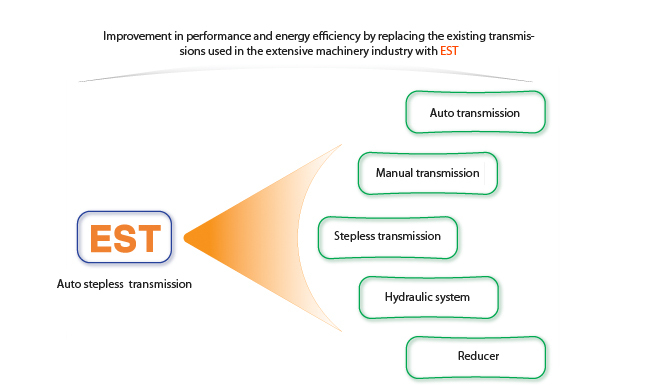 EST is a variable transmission. It changes the rotary motion of the power source into the reciprocating motion and generates output in the rotary power according to on the change in the angle of the reciprocating motion. Depending on the input and output conditions, the angle of the reciprocating motion is automatically changed so without a separate gear control system, gear is automatically, steplessly changed. Gear control : A gear control device is not necessary. 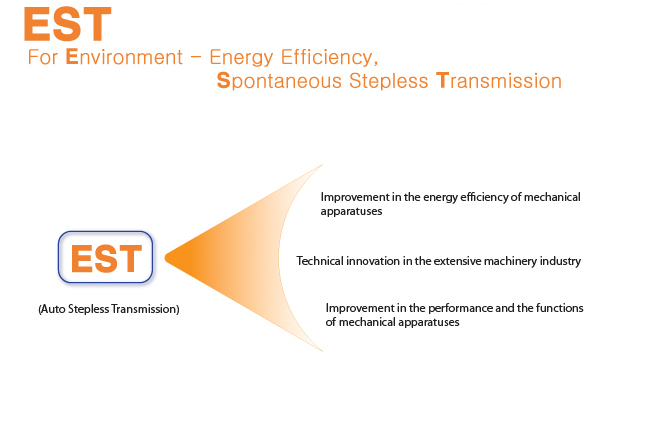 Transmission of overload Different by type Startup load and overload are transmitted to the power source. Startup load and overload are not transmitted to the power source. It copes with auto stepless gear change. Efficiency The efficiency of power transmission is low. The higher the reduction gear ratio is, the lower the efficiency of power transmission is. Highly-efficient power transmission is possible regardless of the stepless gear range. Durability There are many factors that can lower durability.